Since 1957, Bear Creek Scout Reservation has been a summer home to thousands of Scouts. Providing unforgettable camping memories, Bear Creek has afforded many boys their first opportunity to experience self reliance in a beautiful natural setting in the Texas Hill Country. The Ranger Program is designed for first year campers, teaching basic skills, while allowing the camper to get off and running on the requirements for Tenderfoot, Second Class and First Class ranks. 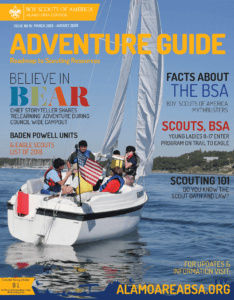 Merit Badges cover aquatics, ecology, field sports, handicrafts, and Scout skills. Some preparation is recommended and best done before camp to ensure the ability to complete certain merit badges. Older Scout Program: Bear Creek is famous for offering challenging programs for older Scouts. The C.O.P.E. (Challenging Outdoor Personal Experience) course is a well-rounded, fun program with low and high element activities (confidence building and group dynamic team challenges). Also available are mountain biking, rappelling, rock climbing, black powder rifle and canoeing on the Guadalupe River. An additional fee will be charged for some of these programs. Bear Creek is divided into two sections. Troops who want to make use of the dining hall for their meal, camp on the Friedrich side. Three meals are provided daily except Wednesday night when troops will be provided food to prepare and eat at their campsites. Troops who wish to experience patrol cooking, camp on the Rickenbacker side. Units bring their own food and prepare it at the campsites. Refrigeration and freezer space is provided. Ice is sold at the Trading Post. Each year, Alamo Area Council hires up to 50 young men and women to staff our premier summer camp at Bear Creek Scout Reservation. Applicants must be registered member of the Alamo Area Council or be willing to register. The preferred age is 16 years of age or older by June 1, 2018. All applicants must be at least 15 years of age by June 1, 2018. Applicants 15 years of age must have successfully completed a two week term as a Counselor in Training. Applicant must exemplify the ideals of the Boy Scouts of America as expressed in the Scout Oath and Law. Preference will be shown to applicants available for the entire period.Please submit both the cover form and application. The Counselor in Training (CIT) program at Bear Creek is open to scouts and venturers ages 14 and 15. This is a volunteer program for potential future staff members. Each CIT will spend at least two weeks working and living with the great Bear Creek staff. It is a chance to see what staff life is like and a chance for us to get to know you.